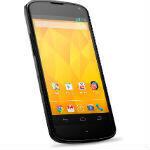 Nexus 4 back in the Play Store, but shipping in "1 to 2 weeks"
Last night, we saw that the Nexus 4 listing in the Google Play Store had changed from "Sold out" to "Temporarily out of stock", and today we heard that the Nexus 4 would be back in the Play Store around noon. It was a bit after noon (around 12:20PM EST), but the Nexus 4 is back up for purchase in the Play Store. Unfortunately, it won't be shipping for "1 to 2 weeks". We have no idea how long the stock will last, you if you want to get your hands on a Nexus 4, you'd better jump over to the Play Store listing now. And, if you're interested, the Nexus 4 bumper case is also back in the Play Store. It is also shipping in "1 to 2 weeks", and is still insanely overpriced at $19.99. Ordered! That was easy as pie...3 month old pie! So is the shipping free, or is it $19.99? Google just created big hype saying they can not meet the demand for Nexus devices ( Nexus 4, 7 & 10). But now we know who is the Android Tablet king. Let them disclosed the sales number if they dare. I do not think they sold any think more than 500K. I see it is now " illegal" to unlock your phone. Let's see if that helps Google. Actually Rf, the XDA brain guys who cracked the serial codes figured out that they sold about 400,000...for the 2 hours people could buy it. Imagine if they had it on sale for the Christmas season instead of being down for nearly a month and a half. Once they ship it'll be 2 day air. The $20 is for shipping not processing AND shipping. See, I feel like if it takes 1-2 weeks to ship, it's not 2 day shipping. I actually just had this argument with my co-worker...I think it's ridiculous. Managed to snag a 8 GB model. I'm sure I'll regret not getting the 16 GB. But they charged my credit card immediately after, does that mean it's shipping soon? damn youre right, i checked my email 2 minutes later and both the Nexus 4 and bumper are already "pending"
It's been almost an hour and it still hasn't sold out. Google is doing quite a bit better this time around. This should help LG lower their dependency on apple to make cash. They have figured things out. IT'S ABOUT TIME As much as I love Jelly Bean and as much as the Nexus 4 is a ground-breaker because of the price, the launch for the second gen Nexus 4 had better be quicker than this. I'll be getting the next one from Google Play this Christmas. Finally! Ordered and received a confirmation email of shipping in 1-2 weeks! Excellent! Anybody want to buy a HTC One S lol? When is it coming to Canada??? According to Engadget its available in Canada now too. I had no trouble using my debit card to purchase one. They did take my money out of my card right when I purchased it so that sounds like good news. I bought mine with a debit. No issues to speak of. Is there something specific you're worried about, because a credit and a debit card should work identically? Ordered! Also, why is $20 "insanely overpriced". I can remember exactly but wasn't apple's crap bumper that much, or more? $20 for a thick rubber band is insanely overpriced, especially given how inexpensive the phone is. If you're comparing the price to an Apple product, I think you already know that it's overpriced.